News reports broke this recently about the discovery of foam insulation manufactured in China that includes CFCs. According to the lead report by the Environmental Investigation Agency, now carried in several highly credible news sources, scientists noticed a return of CFCs in the atmosphere earlier in 2018 which led to the search and discovery. CFCs were banned in the 1987 Montreal Protocol for use around the world (China is a party to that agreement.) The ban was an effort to restore the ozone layer, which for years had been depleted by the use of CFCs (a fact totally undisputed unlike the current situation with global warming and climate change.) The ozone layer is what helps to protect life on earth from harmful UV rays that can cause skin cancer and premature aging among other serious negative effects. Efforts appear to be underway now in China to curb the use by companies there that openly admit to using CFCs in the manufacturing of foam insulation “because it was cheaper and made more effective foams.” Hopefully, these companies can be compelled to cease the use of CFCs. All this emphasizes the need for consumers to consider environmental factors when making buying decisions about any building product. The use of CFCs in foam insulation should raise some red flags and questions by anyone considering that product. But it illustrates the bigger need for consumers to understand the environmental characteristics of products they consider in general. 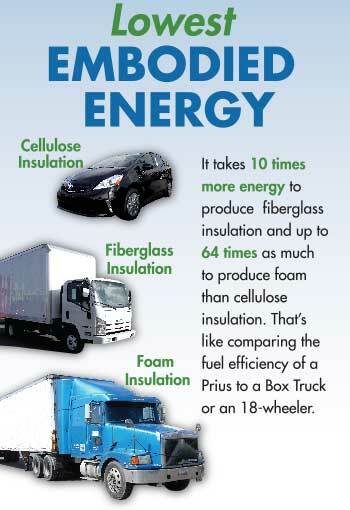 Foam insulation, regardless of CFCs being used, is one of the least Eco-friendly insulation products available. Foam is a petroleum-based product, so it is made from a non-renewable resource. Insulation made from foam contains very little if any recycled content and requires very high embodied energy to manufacture. It is also generally more expensive to purchase and install than other insulation products and thus can require a longer recoup of the investment. Cellulose insulation offers similar energy saving benefits and insulating characteristics to foam, is less expensive, and most importantly for those concerned with environmental impacts, is the most Eco-friendly of all the popular types of insulation products.